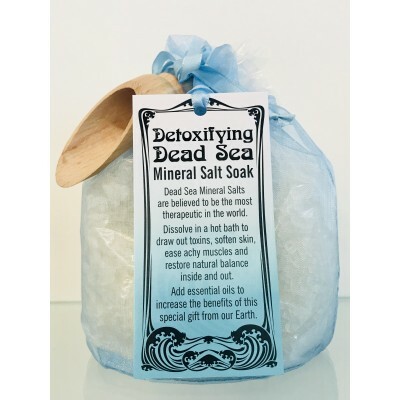 Mineral salts from the Dead Sea are believed to be the most therapeutic in the world. When Dead Sea mineral salts are dissolved in bath water, they are absorbed through the senses, drawing out toxins, easing tension and sore muscles. Many of our customers use Dead Sea salts for relief from skin ailments such as psoriasis and eczema. Restores natural balance inside & out. 24 oz in reusable bag. Directions: Add 2 - 3 oz. salt to warm bath water. For maximum benefits, soak for minimum of 20 minutes. We like to add 10 drops essential oil for further benefits.